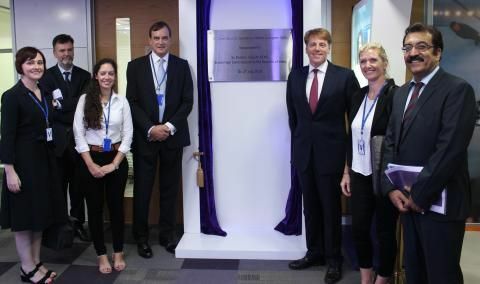 Sir Dominic Asquith, British High Commissioner to the Republic of India, has inaugurated BT’s new Cyber Security Operations Centre (Cyber SOC) in Gurugram, India. Using a range of advanced cyber security tools, and through partnerships with key suppliers, the Cyber SOC will monitor threats against BT’s own assets and its customers’ networks on a 24/7 basis. BT’s cyber security specialists will be able to detect, analyse and mitigate cyber threats in real-time, working closely with incident response teams to ensure that issues are addressed as soon as they are discovered. BT is one of the world’s leading cyber security providers, with circa 3000 cyber specialists around the globe offering services in Managed Security, Threat Intelligence and Security Consulting. BT’s Security division works with international organisations such as Interpol and Europol to combat cybercrime, and is one of the fastest growing areas of BT’s business. BT has been regularly recognised as one of the world’s leaders in managed security services by industry analysts such as IDC. The Cyber SOC in Gurugram will provide ‘follow-the-sun’ services for international businesses, including threat assessment, investigations, intrusion detection & prevention, ethical hacking and penetration testing. The new Cyber SOC will employ a further 100 cyber security specialists. BT already has a team of 250 security people based separately in Gurugram, providing security services such as firewalls and device management. Sir Dominic Asquith commented: “I’m delighted to inaugurate this new Cyber Security Operations Centre in Gurugram, which is another fantastic demonstration of the UK’s world-leading cyber security expertise. This is exactly the kind of investment that the ambitious UK-India Tech Partnership, agreed by our Prime Ministers earlier this year, aims to achieve”.